A view of the Semple Stadium goalmouth during last month’s All-Ireland club football semi-final. 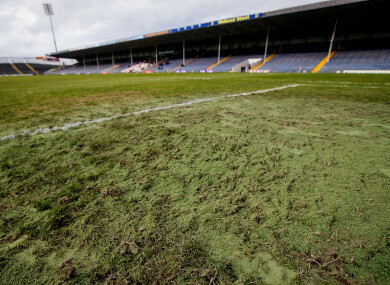 AN INTENSIVE SPRING schedule of games has prompted the decision to close Semple Stadium until the start of May and allow repair work to take place on the pitch. Yesterday’s meeting of the Tipperary and Clare footballers in a Division 2 league clash will be the last match at the venue until Liam Kearns takes his Premier side into action in a Munster SFC quarter-final on Saturday 11 May against Limerick. That game, which preceded by the ladies football league tie between Tipperary and Monaghan, was the 11th in nine weeks at Semple Stadium since an All-Ireland intermediate club semi-final was held on 19 January. The Thurles venue has traditionally hosted the All-Ireland senior colleges hurling finals but they have been switched to Tullamore next Saturday 30 March while the Division 1 hurling league decider has been fixed for Croke Park next Sunday 31 March. Semple Stadium is not the automatic location for the hurling league decider – Nowlan Park and the Gaelic Grounds in Limerick have hosted the last two finals – but it has been the venue for 10 finals over the last 20 years. It would be regarded as the natural choice of a neutral venue for 2019 finalists Limerick and Waterford but they will instead head to Dublin as part of a Croke Park triple-header with the football and camogie league deciders. The Croke Cup (SAHC) final between St Kieran’s Kilkenny and Presentation Athenry along with the Paddy Buggy Cup (SBHC) decider involving St Raphael’s Loughrea and Castlecomer CS, will now both take place at the Offaly county ground. Another fixture consequence of the decision to shut the Semple Stadium doors will see Tipperary’s Munster minor football ties against Waterford on 10 April and Limerick on 24 April switched to Sean Treacy Park in Tipperary Town. Putting an astro-turf surface along the sideline in front of the Kinane Stand is being considered. “It’s in a bad state now, we just need to do a lot of work on it,” outlined Tipperary county secretary Tim Floyd. “There’s a lot of breaking in the soil and a good bit of sanding and a bit of reseeding on it as well as sodding squares. We’re looking at possibly doing astro-turf down where the subs warm up, the full length of the field outside the sideline. “If we’re going to do that, we’ll do that now in this time but we’re just looking at the other options. It’s in such a bad state that it’s probably the only way you’ll be able to maintain it. Floyd described the programme of games to date in 2019 as ‘exceptional’ but is confident they will be able to do the necessary work in time to restore it to prime condition. After the football tie on 11 May, the Tipperary hurlers have round-robin Munster games at Semple Stadium against Waterford on 19 May and Limerick on 16 June. “It was kind of exceptional really the amount of matches that have been on it. The fact that the league starts earlier and the club championship semi-finals are on as well. “We’ve had games likes Dr Crokes and Mullinalaghta that we wouldn’t normally be getting. You put on those games earlier on in the year, there’s no real growth back from them. Conditions weren’t the best (in February), the ground was deteriorating with little opportunity to recover.